The cats and kittens shown below are available for adoption from the shelters and rescue groups that will be attending Whiskers in Wonderland on Sunday, November 12, 2017. 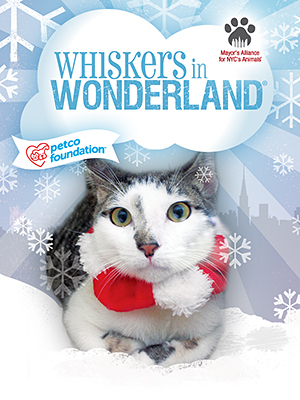 If you see a kitty you'd like to meet at the event, please contact the organization listed on his/her Petfinder profile to find out if he/she will be available at Whiskers in Wonderland. Dozens of cats, kittens, and rabbits will be available for adoption from Alliance Participating Organizations. Confirmed groups include Animal Care Centers of NYC (ACC), Animal Rescue Fund of the Hamptons (ARF), ASPCA, Bideawee, Bronx Tails Cat Rescue, K9Kastle, KittyKind, Linda's Cat Assistance, Posh Pets Rescue, Rabbit Rescue & Rehab/NYC Metro Rabbit, and Zani's Furry Friends. All animals for adoption have been vaccinated and spayed or neutered. Adoption fees vary by group.